We read in one of the brochures that Capestang had a Sunday market in the village, so we followed the stream of people with baskets and found it easily. They sold clothing, books and baskets, but mostly they sold food. We could not help ourselves and bought yet more yummy cheeses. They may smell like old socks but they certainly taste good. We also bought ripe black figs, fresh melon, red cabbage, spring onions, coriander, a dark grain baguette and some lavender honey. Food heaven! Back at the boat we opened up the sliding roof to let in fresh air and snacked on a platter of local cheese, fruit and bread. Ripe Brie, Emmentaler, pepper encrusted goats’ cheese, sweet grapes, nectarines and a glass of rich red wine. Yummy! 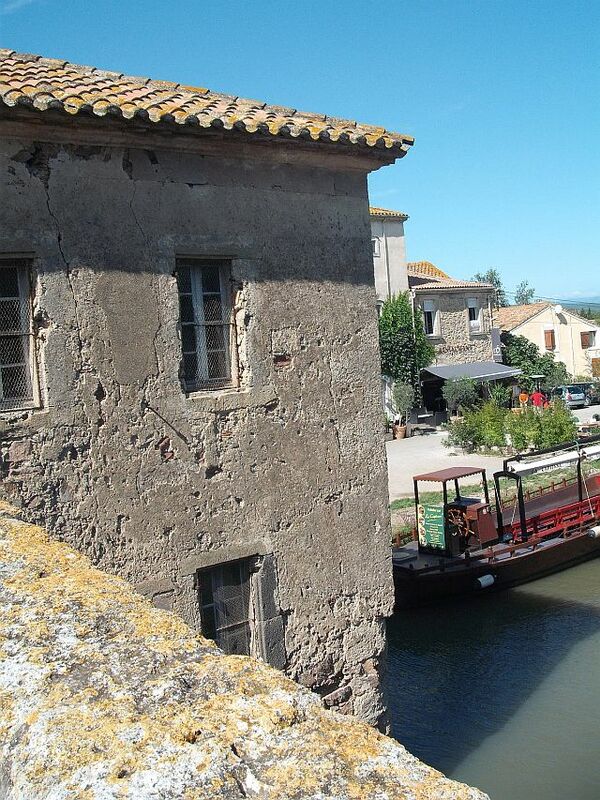 Apart from the scenery on the canal, which is a UNESCO World Heritage Site, Capestang has the distinction of having the smallest bridge on all the canals in France. 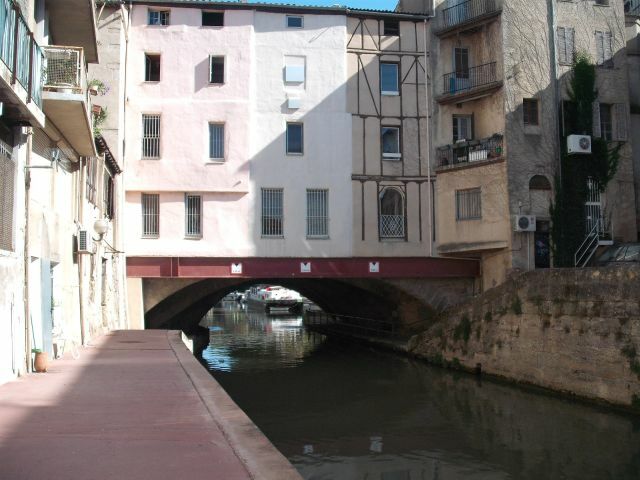 After lunch we packed up, headed under this bridge and veered left to Narbonne. We met a French couple heading in the same direction as us and managed to converse in “Frenglish” through 5 locks together. 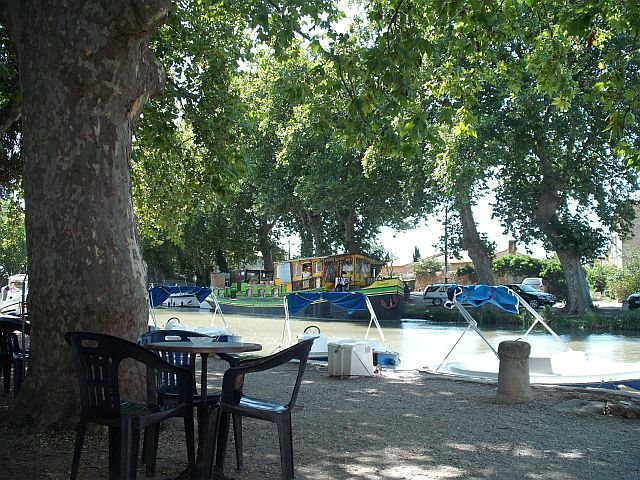 We stopped off for the night just outside the lock at Saleles D’ Aude. It was nice to be away from the other boats for a change. We lay in our cabin that night listening to the sounds of nature, and what we thought were owls hooting. We left our peaceful sleeping spot and set off for Narbonne. 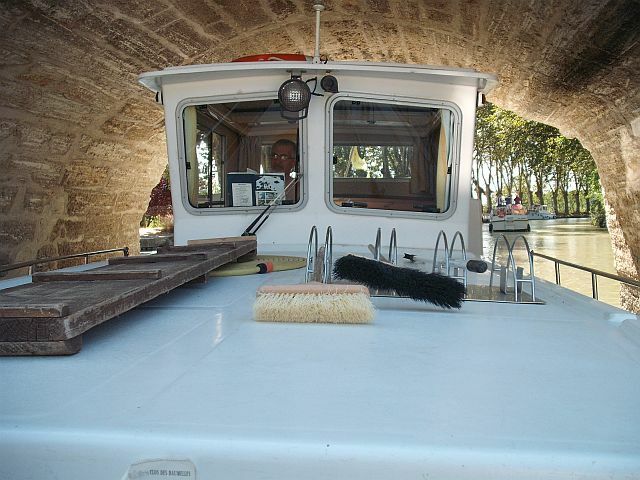 Out boat was a 9.5 m non-fly-bridge, Penichette. The Le Boat style cruisers were massive next to our boat but for two of us the Penichette was plenty big enough, however it would have been tight if there were two couples on this boat. 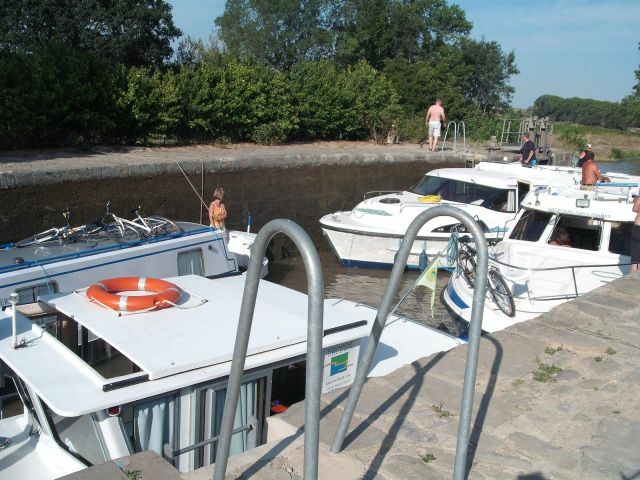 We met up with two Scottish couples on another boat and travelled through 5 locks with them. One sort of makes ‘friends’ with other people heading the same direction as you for the time you are together. We got to Narbonne by lunchtime and still managed a water top-up en route.The south of France is normally a warm part of the world, but by afternoon it was sweltering hot. I stripped down to my bikini top to keep cool. 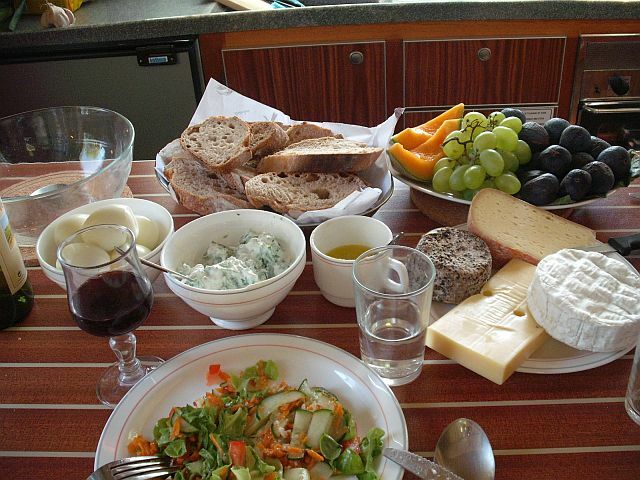 A typical lunch on our boat. 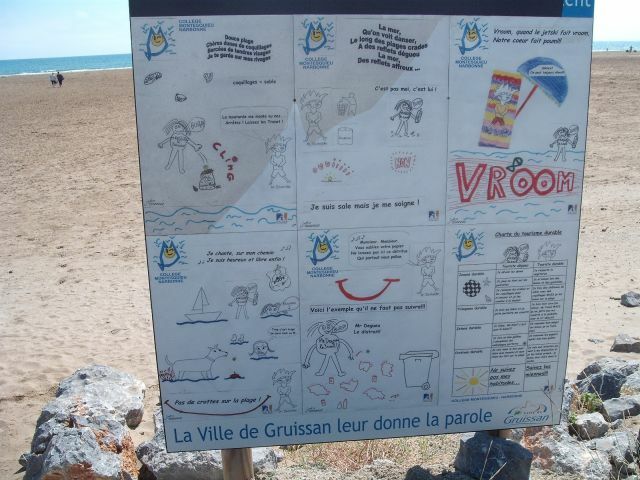 Later, we went to explore Narbonne and found the Tourist Info Offices. 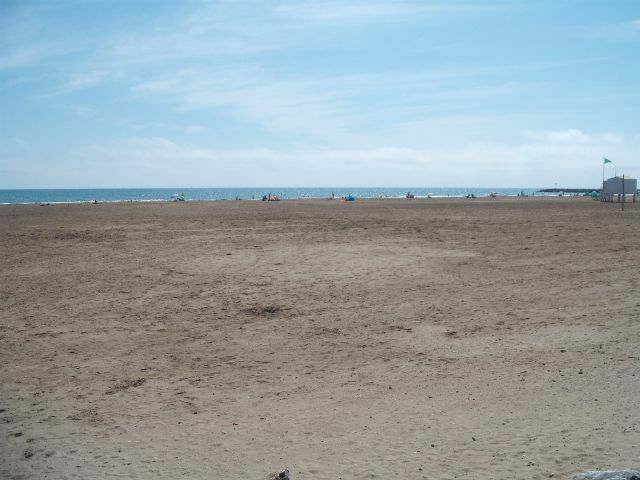 They allowed two hours free Internet there so we planned to make a turn before we left Narbonne. We compared boats as we wandered along the canal. People actually live on the rivers and canals. It is amazing how some boats have home comforts, flat screen TV’s, wi-fi and washing machines. They are powered by batteries, but also by wind turbines and solar panels. There are even huge floating hotels where guests languish in luxury. We had a long chat to a Canadian who had lived on the canals in boats since 1965.
through a building! There was more typical Mediterranean architecture in this region. We noticed eccentric people who appear to roam the bigger towns and cities with packs of dogs. We suspect they are street people. 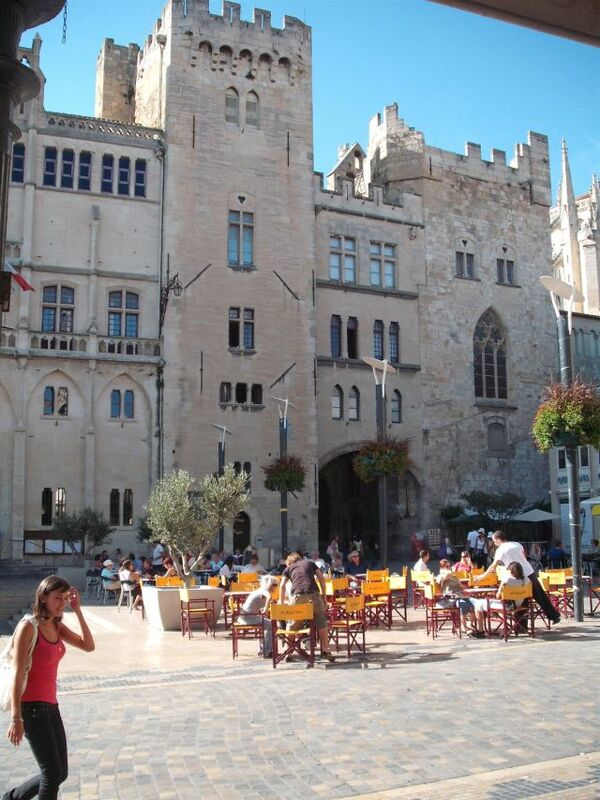 Places like Narbonne are ideal for a sleepover as they have the requisite shopping, eateries and amenities one needs. But a night in the middle of nowhere with not a soul in sight and the only sounds are water lapping and trees rustling, are what make this such a special holiday. 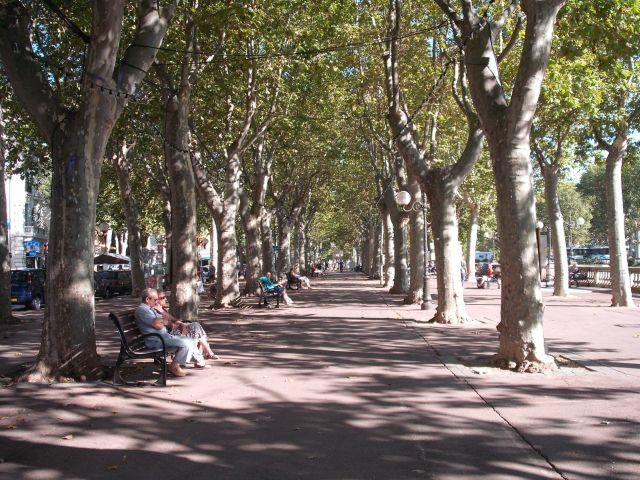 At about 19.00 as the day started to cool we went for a run along the canal under the shady plane trees. I took a detour along the vineyards which stretched out behind the trees for miles. Back at the boat, after a warm shower, my other half made a chick pea curry with rice and a raita. We had shore to boat power so we sat till late tidying up photos and working on the laptop. 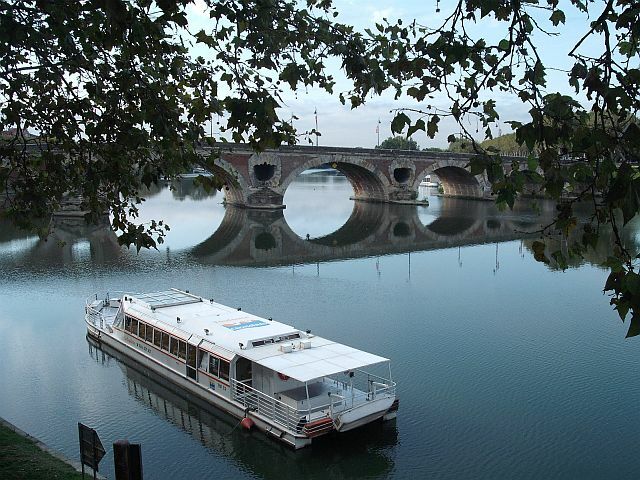 Read my advice and hints for boating on Europe – by using this link. We flew in to a warm, slightly overcast day in Toulouse, the pink city of France, and the epicentre of aeronautics and aviation. 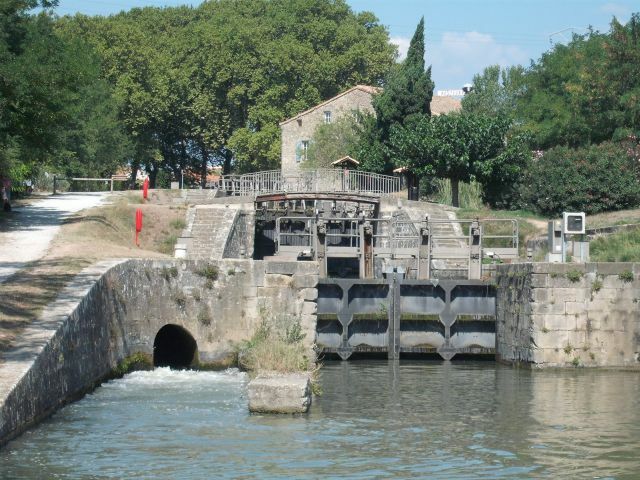 We planned to arrive and leave via Toulouse for our canal boat holiday along the historical Canal du Midi. 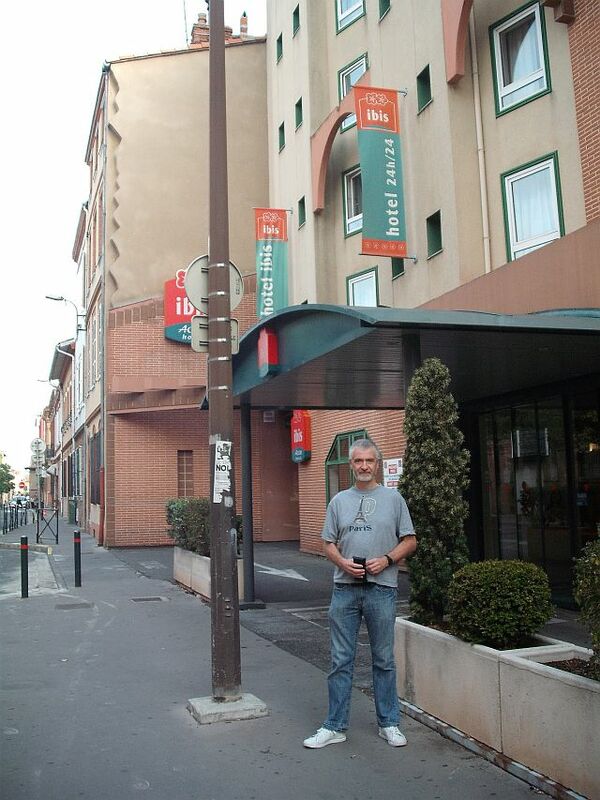 The French style of doing things was immediately apparent as we spent our first hour making our way to the hotel. We had done a basic French Speaking course to be on the safe side. We like the Michel Thomas method of learning a language. We did try a language school but forgot all they taught us. With Michel Thomas we were able to at least make ourselves understood and string words together. Maybe we were lucky, but we found the French helpful and friendly, contrary to expectation. It started at immigration. Border control let you through with a stamp in your passport and skipped the harrowing interrogation some countries find necessary. It’s a much nicer way to start a holiday. The airport was clean and their information or ‘accueil’ went beyond what was required to help us. They phoned the Ibis Hotels to find out which one we’d booked into. Who knew there were three? And they gave us plenty information and maps so we could find the shuttle bus, all in perfect English. At least two people saw us with our map and offered us directions as we walked to our hotel so we eventually hid our map. We were not expecting the French to be so helpful. We were glad we have made the effort to learn basic French many times. We like Ibis Hotels. Ibis Hotels Booking on-line is easy, and the rooms, although cosy, are always clean and comfortable. We opted to have the hotel French style breakfast at €7.50 each, which was a spread of the usual fruits, cereals, pastries as well as some regional foods such as cheeses, tortilla and good coffee. We had two days to explore the city on foot before we collected our boat. 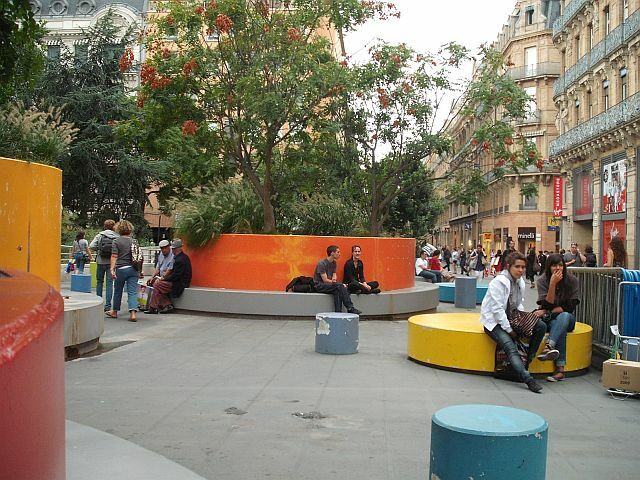 Toulouse is the 4th largest city in France. 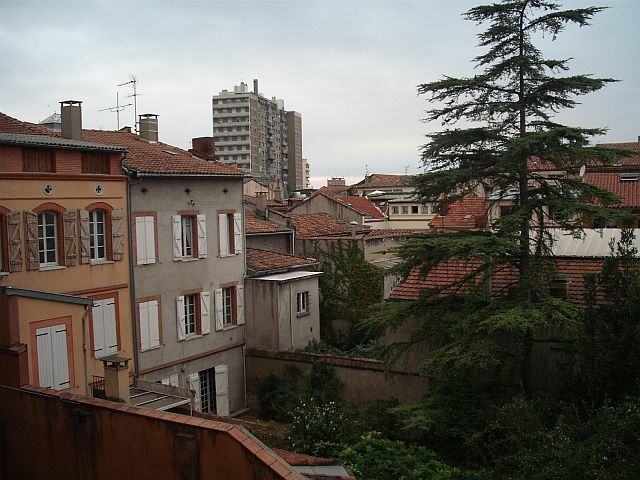 It’s home to Airbus, the aeroplane manufacturers, and has the 2nd highest number of universities in France. The modern energy contrasts sharply with the old architecture of the city. We strolled through cobbled walkways passing by cafes and buildings with typical Mediterranean architecture, terracotta roofs and shutters on the windows. 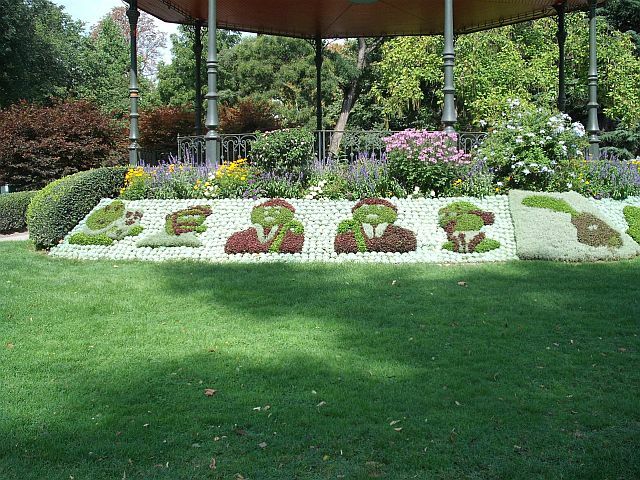 Then we went to the city gardens, which had fountains, sculptures and plants grown to resemble faces and objects. 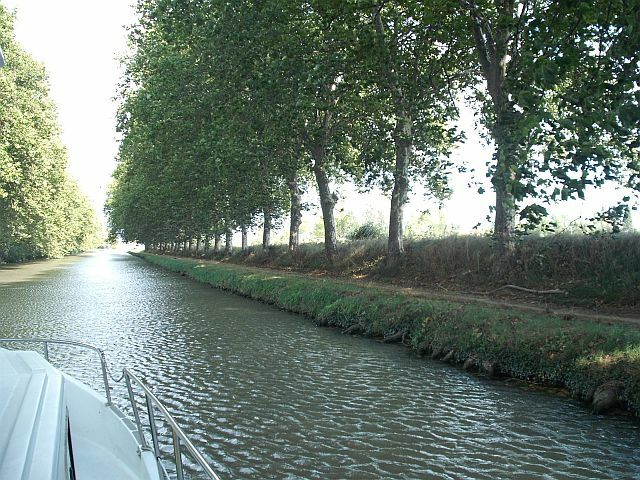 We ambled along the Garonne River and the Canal du Midi, which was built in the 1600’s, and was a vital link between the Atlantic Ocean and the Mediterranean Sea. At lunchtime we remembered the superstores in France often have cafeterias, which offer local cuisine at excellent prices. We found Monoprix, a block away, and we each had a plate of assorted fresh salads from the buffet, boiled eggs, a small carafe of red wine to share and two carafes of water. The French style of eating is right up our street. They utilise lots of fresh vegetables. Fruits and salads are common components of a meal. Plain tap water and a small glass of wine usually accompany food. They take their time to enjoy lunch, which is from 12.00 to 14.00. Everything comes to a complete halt lunchtime in France, as people head home, baguettes in hand, to enjoy their midday meal. 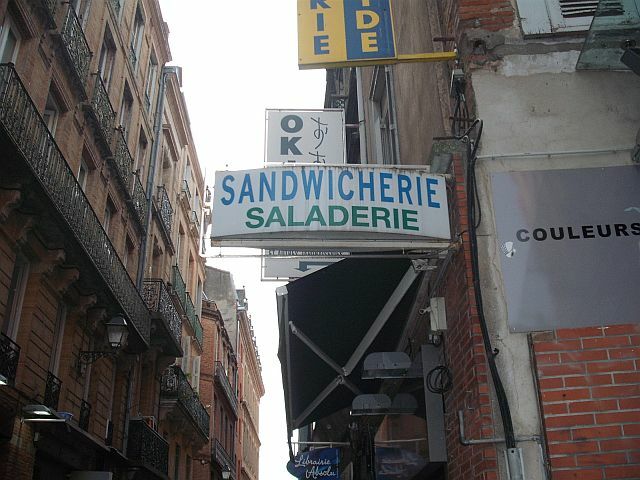 That said that, we avoided the pricey French Bistros and Brassieres. The challenge of deciphering what we could receive on our plate, as well as the prices, kept us on the streets where we found great food. We regularly ate at Lebanese cafés where a huge combination mezze and salad platter would cost around €8.00 each, and a large carafe of wine to share (500 ml) was about €4.00. We ended the evening with a stroll along the Garonne River, which came alive at night with students engaged in various activities along the banks. 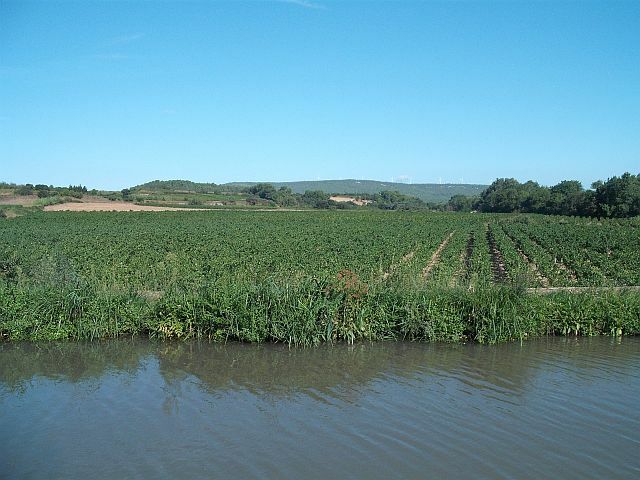 Click here for Barging in France Day 3 and 4.